One of the guiding philosophies behind Endurance Nation is that we think of the team as an educational organization as much as a coaching organization. With that thought in mind, we developed what we consider a new way of thinking about triathlon training. 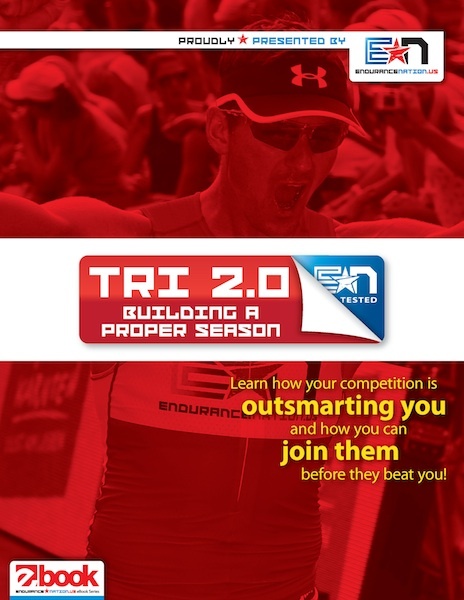 We’re excited to announce the upcoming release of Triathlon 2.0: Building a Proper Season (How Your Competition is Outsmarting You, and How You Can Join Them). In Triathlon 2.0, Coaches Rich and Patrick teach you how Endurance Nation Age Group athletes achieve incredible results in a way that fits their existing lifestyle. Many times, triathletes and triathlon coaches talk about input versus output: you’ll only get X amount faster if you put in Y amount of time training. In reality, we’ve found that regular, Age Group triathletes are making bad, misinformed decisions about how to allocate time, how to train, what gear to buy, and ultimately, how to plan out their triathlon training season. In Triathlon 2.0, we smash those myths to pieces by breaking down the stereotypes of “typical” triathlon training, sharing with you the experience and perspective formed over years of triathlon training, racing, and coaching. We then show you how we’ve successfully applied these methods to a huge number of age group triathletes, just like you, with proven results. Your triathlon will only be successful and enjoyable if we can make it fit in with the rest of your life: family, friends, hobbies, work, sleep, etc. Your life – home, work, lifestyle, family and more – gives you a Box of time, into which you fit your training. Your job, as a self-coached triathlete, and our job as coaches of age groupers just like you, is to achieve your best results within this Box that life gives you. In Triathlon 2.0, we share with you how we do that, methods honed through over 20 years of coaching across thousands of athletes. Triathlon 2.0: Building a Proper Season (How Your Competition is Outsmarting You, and How You Can Join Them) will be released early this fall, for a limited time, and exclusively to subscribers of the Endurance Nation newsletter. To get in on this valuable training manual, simply sign up for our weekly newsletter using the form below, and we’ll send Triathlon 2.0 as soon as it’s released.